Objective: Use safe procedures for starting and stopping a tractor. Present the information below on safe starting and stopping practices. Have an experienced tractor operator demonstrate safe techniques for starting and stopping a tractor. Explain each technique as it is demonstrated. Supervise workers carefully as they practice safe starting and stopping practices. Note: If necessary, you can ride the tractor as an observer while workers practice. However, stress to workers that a rider is allowed only for training purposes. Tractors are common and look easy to operate. However, incidents can happen if safety is not carefully observed. Before mounting the tractor, make sure guards and shields are in place and in good working condition. Use provided handrails for mounting and dismounting. Adjust the operator’s seat for fit and easy access to controls. Place the gearshift lever in neutral or park. Place all hydraulic controls in neutral. 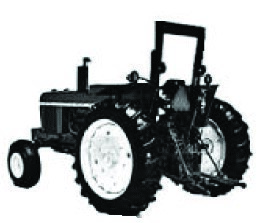 Tractors will start in gear if normal starting circuitry is bypassed. Start the engine from the operator’s seat with the transmission in park. Do not start the engine by shorting across starter terminals. Never start the engine while you are standing on the ground. If jumper cables are needed to start the engine, make sure polarity is correct. Reversed polarity will damage the electrical system. Always connect the positive cable first and then the negative cable. Escaping gas can cause an explosion, so position the ground connection away from the battery. This will help keep sparks away from the battery. Follow the instructions in the tractor operator’s manual. Always wear eye protection when working around batteries. Lock the brake pedals together when driving. Lower all hydraulically powered equipment to the ground. Put the gearshift lever in park or neutral and set the brakes. Turn the ignition key off and remove it to prevent tampering or release of energy. Keep a copy of the operator’s manual on the tractor or close by. To prevent falls, keep the operator station free of oil, grease, mud, and tools. Keep trash away from the exhaust system to prevent a fire. Maintain control lights and gauges. Ventilate to avoid asphyxiation when operating tractors indoors. No riders (except for specific training purposes). Never start the engine by shorting across starter terminals. When jump-starting an engine, avoid sparks around the battery and wear eye protection. Always apply brakes evenly and disengage the PTO before stopping the tractor.